I couldn't find a thread on this, so I'm starting it. This thread is to share your non-SW drawings and art. Here's mine- and remember, I'm only 12, and most of these were done in my spare time at school. So, post your art and/or drawings here! Hmm... those drawings aren't very bad at all, for a seventh-grader. The faces could use a little more expression and detail, but the overall posture of the people is pretty well drawn. I have some artwork that I'd like to post once I get it scanned. A cat, when pushed off a table, always lands on its feet. A piece of jellied toast, when pushed off a table, always lands jelly-side down. A cat tied to a piece of jellied toast, when pushed off a table, hovers in a state of quantum indecision. How does being 12 relate to your artistic skill at all? Skill doesn't come with age, skill comes with practice and lessons. I know someone about your age who probably can net a job as a cartoonist, and I know thirty year olds who draw like chickens. Anyways, I feel as if their hands are huge, and the scabbards seem to just float beside your belts. I have to say that Mangles is right. I didn't get my talent from age. I got it from practice. Drawing in class instead of paying attention is a good way to practice. You just have to find your style of drawing/art. You also have to find what kind of art you are best at. (Drawing, Painting, etc.) Once you find that you're on your way. Just remember to stick with what you are best at most of the time. If you want to get better at others, give them a try. The worst thing you can do is to give up. Just keep on going. Don't get discouraged when you get criticism. Just try and listen to it and improve yourself. This is what my brain produces when I'm just being myself and not trying to crack a joke; I actually did have a dream about such a figure. It was really scary, but not in the Freddy Kruger sense, rather in the "what in the world is going on?" thing. I mean, flying through space with Jesus surfing on an asteroid? I was eating lunch last summer (can you guess what?) and decided I really needed to draw it. I plan to sell it... If I can find it. 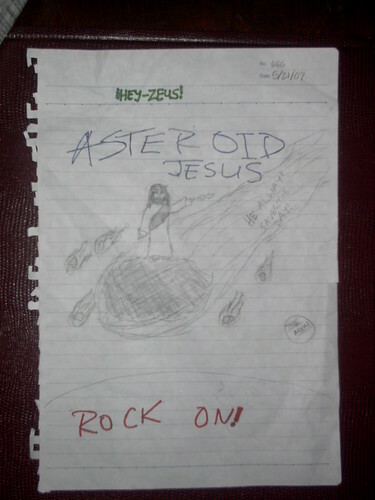 Come to think of it, Asteroid Jesus disappeared as well. I think there is a black hole of Ryan/Conan/Clive's artwork in my basement. Both of those are clickable. If anything, this thread should be aborted. Hey, don't be hatin' on me. I was just implying that practice comes with age and the amount of time that you have been drawing. It's like trapshooting; the more you do it, the better you get. The older you are, odds are that you've had more time doing it. That's all. I myself am an avid cartoonist. Not that good of one, partly due to my extremely shaky hands, and also of my lack of being able to put all the ideas in my head down on paper. Anyway, here are a few of my better ones to share around. It's kinda fun to draw Marvel, SW, and DC guys in this way. Reminds me of our bubble heads . I'm somewhat good at drawing dragon-ish creatures. "Do you really think so, Scout?" "God created men; Colonel Colt made them equal; John Browning made it so you could kill them at 12 miles with a bullet the size of a snausage�. That came out a little harsh to me. I agree that skill comes with practice, but I you take 2 artists that practice about the same amount of time weekly, well it's quite obvious the 30 year old artist has the advantage. Personnaly, I think you have good observational skills Antilles. Your characters have nice poses and good proportions. My favorite is your archer. I don't feel like their hands are huge at all. Some even seem too small. Keep practicing to get more expression and cleaner lines. Take some time to draw static objects. It'll give you a chance to practice shading, folds in fabric, light reflections, texture... etc. I just sketched this one in 10 minute. 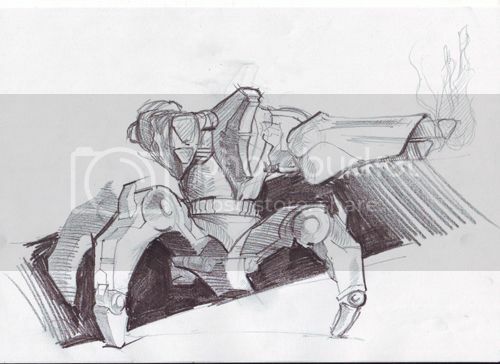 It's one of those new dragoons from starcraft 2. I'm really tired after 5 days of continuous drawing and rendering for school ...so the shading on the torso doesn't looks good at all. Wow, Olog. What are you? An engineer, an architect? Olog is a fuzzy Romanian art-god. Duh. How does being 12 relate to your artistic skill at all? Skill doesn't come with age, skill comes with practice and lessons. I know someone about your age who probably can net a job as a cartoonist, and I know thirty year olds who draw like chickens. I kinda just said that because last time I posted some drawings, someone said that they thought I wasn't all too good, so I wanted to say that I was only 12 and just in the last few years I really started getting into drawing alot. I have a watercolor I did this year for Art class I'll have to post later. And Adrenaline, those are awesome!!! Now that rocks!!! And so does the book too. Nicely done. Whoa, thanks guys, I rarely get any feedback for my drawings so any kind of comments are welcome. Here's another drawings I just finished I wanted to try out some Zealot movements this time, crouching and running . Oh, almost forgot, Antilles you're on the right track, people aren't all born with talent but they can get talented. For a 12 year old, you're good, you just need practice and have a good sense of observation. I'm actually a student in industrial and graphic design..
What kind of careers does that pertain to? Here is the watercolor, and here is a random bounty hunter I drew the other day. No cost at all. I'd be happy to draw you one. If you could just PM me with your choice of picture, that would be great. I have finals coming up next week, so I probably won't get it done until after next week, when summer has started. Adrenaline, I sent you a PM. I don't mind waiting if it's free. I only said that because you called yourself "a great artist"... And I just that the came off a little offensive, to the real artists here. But, you have gotten better. The stuff you posted in this thread are OK for your age. But the stuff in your other thread really was no where near as good as this. Babyjawa gave some great advice. Me, I only draw cartoon guys. I wish I had more to for drawing. Yeah, the other drawings weren't too good. Do you mind posting your cartoony guys? My cousin (superdoopertrooper) does stuff like that alot. I'm so buying one of your books. What are they called? Oh dear God Olog, those are fantastic. 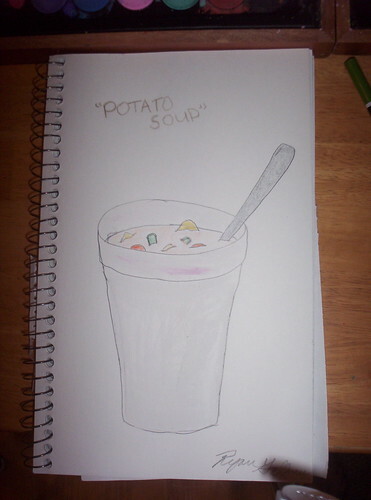 I'm drooling with envy at your artistic skills. Me, I'm a horrible artist, but a decent cartoonist. Maybe when I get a hold of my camera!